The tabletops all had money themes collages going on under the glass. 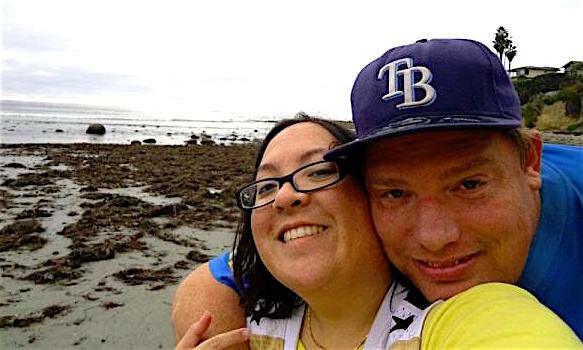 Jake and I were up in the Northland (aka North County) for a little errand. The little errand took much longer than we though it would and it was quite late by the time we got around to eating dinner. I did some Yelpy research and found a place called The Money Pit Drive Thru and decided to go there because the name sounded rad. Yes, that’s sometimes how I decide on where to eat: if it’s got a cool sounding name, most likely I will go visit it. The Money Pit used to be a bank. You’ll clearly see the theme in a second. I feel like wolves should be howling in the background of this photo. This is the front entrance of the Money Pit. 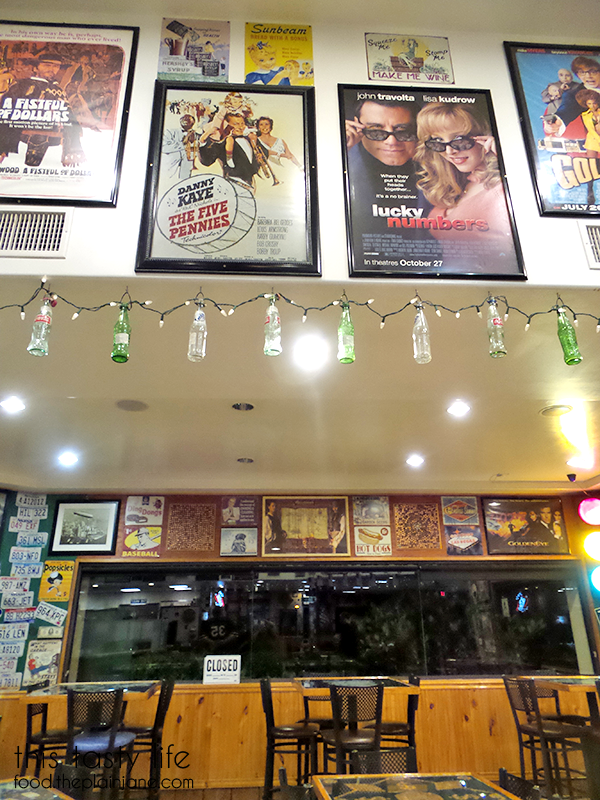 Lots of movie posters, vintage signs plus soda bottle lights! 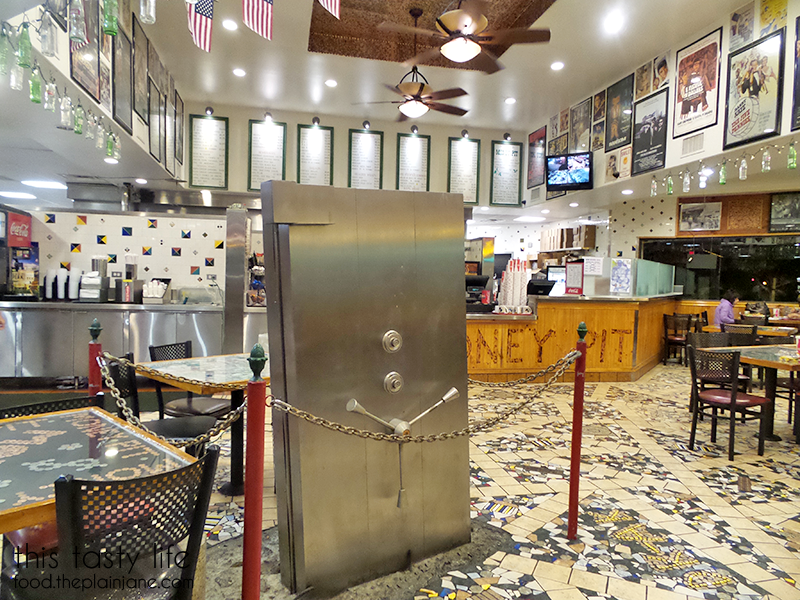 The old bank vault sits on the floor near the front register. Holy knick knacks galore, Batman! If you look closely at the movie posters, there’s a theme of money/numbers there, too. 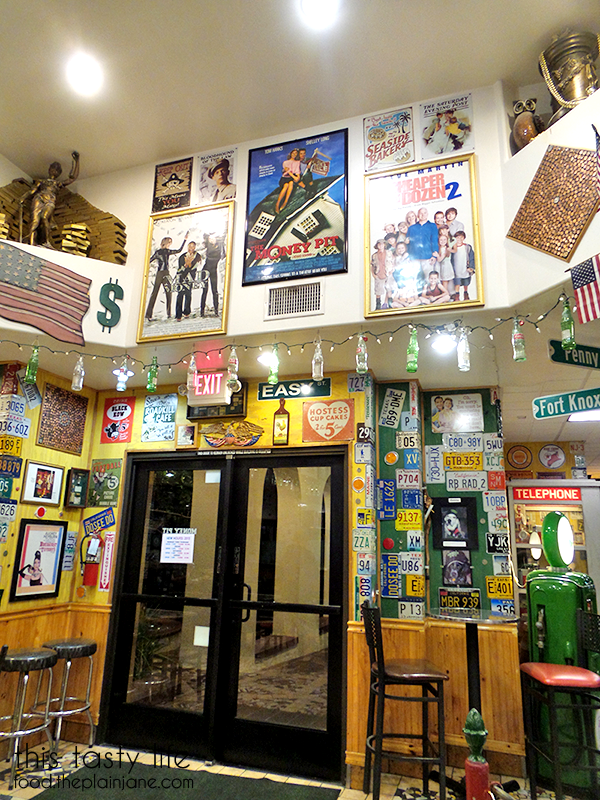 “Fifty Dollar Bill”, “Mad Money”, “Goldmember”, “Lucky Numbers”, “The Money Pit” (of course)”, “Cheaper by the Dozen”, etc. 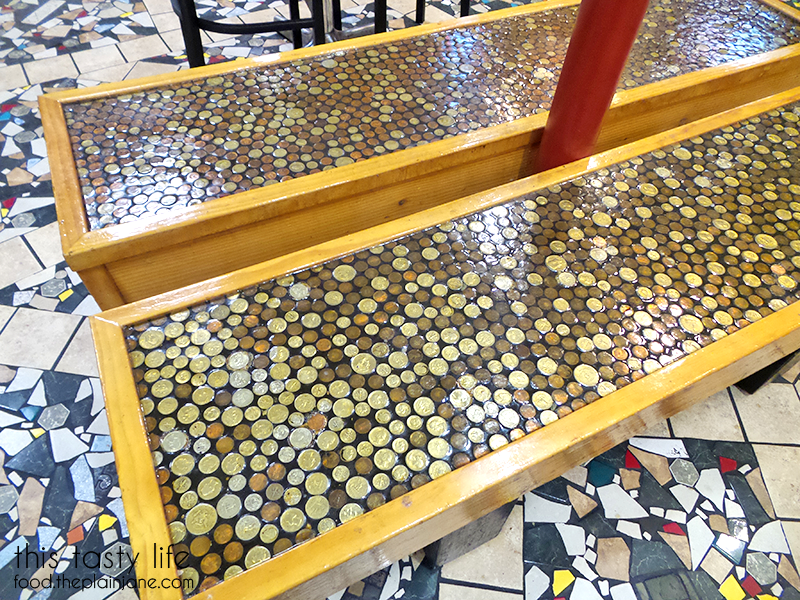 The benches were even filled with old coins. There was A LOT to take in and we were only there for a few minutes since we got there about 10 minutes before they closed. 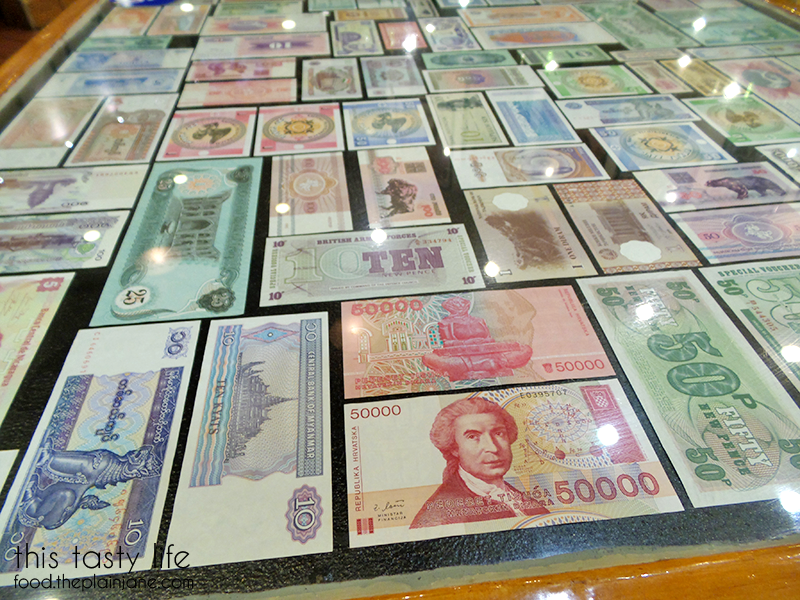 This one had all foreign bills under the glass. 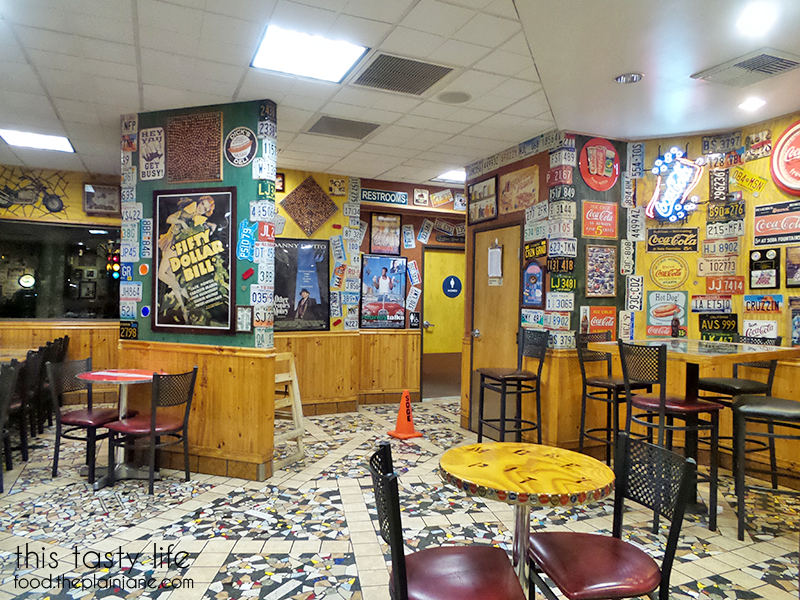 I loved how kitschy this place was! 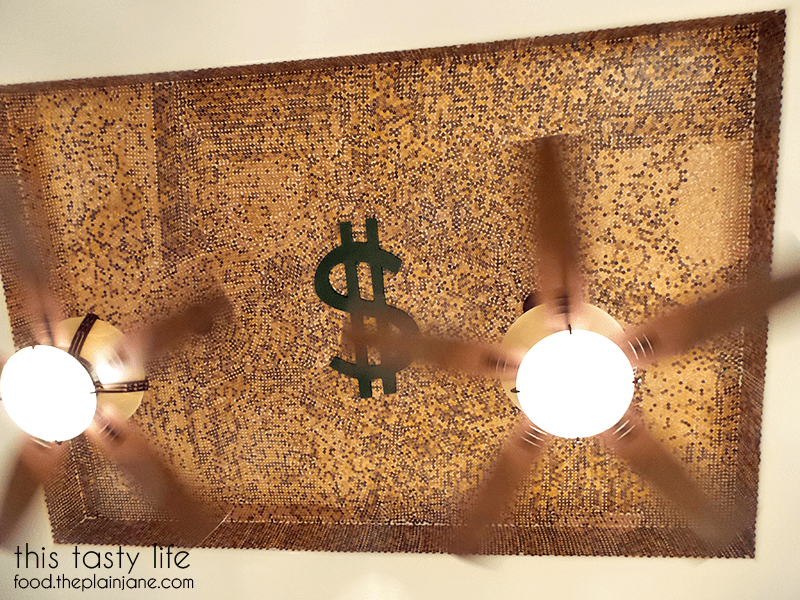 Even the ceiling had a money theme going on. 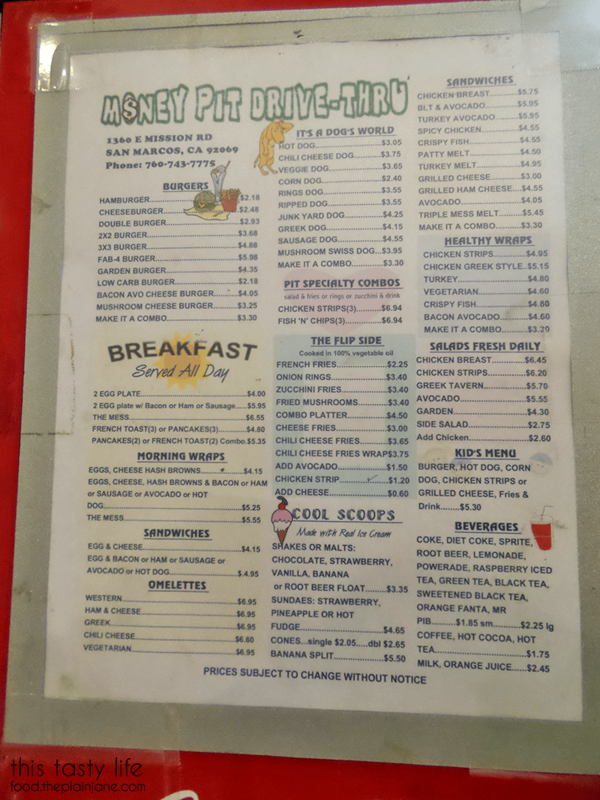 This menu is easier to read then the ones up in the restaurant. Even though we came in right at closing time and had to take our food to go (we just sat outside on the patio) the food was freshly prepared. 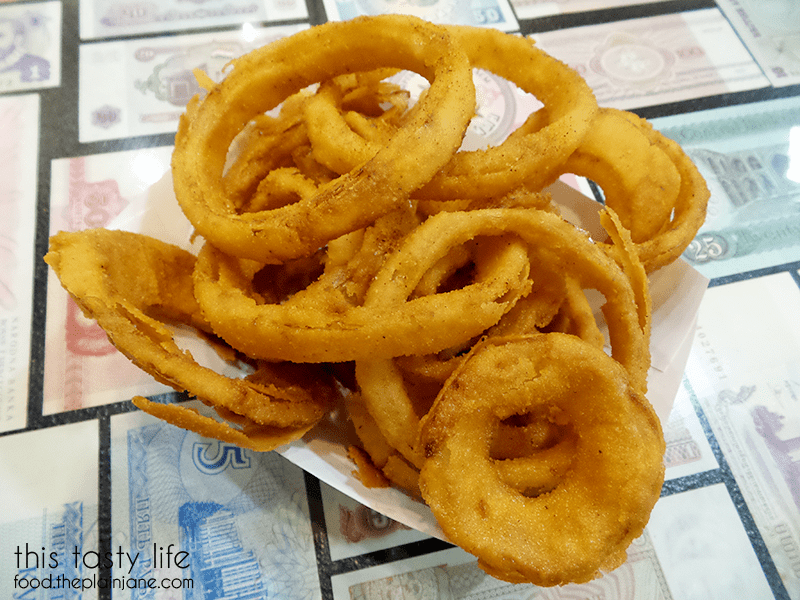 These onion rings were piping out and hadn’t just been sitting around. They were nice and crisp and the batter managed to stay on the onions. 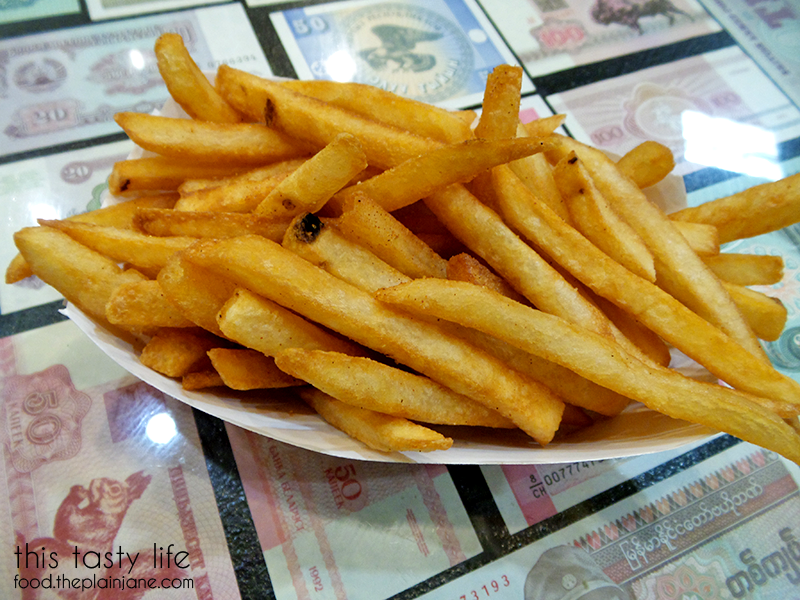 The french fires were also piping hot and had a nice crispiness to them. 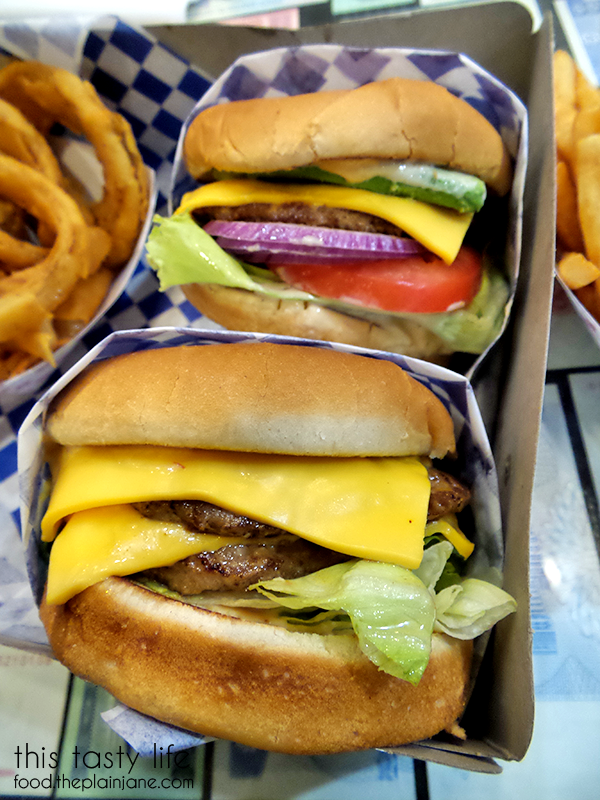 We were both surprised by the price of the burgers which were in the $2-$4 range. Jake ordered a 2×2 cheeseburger. 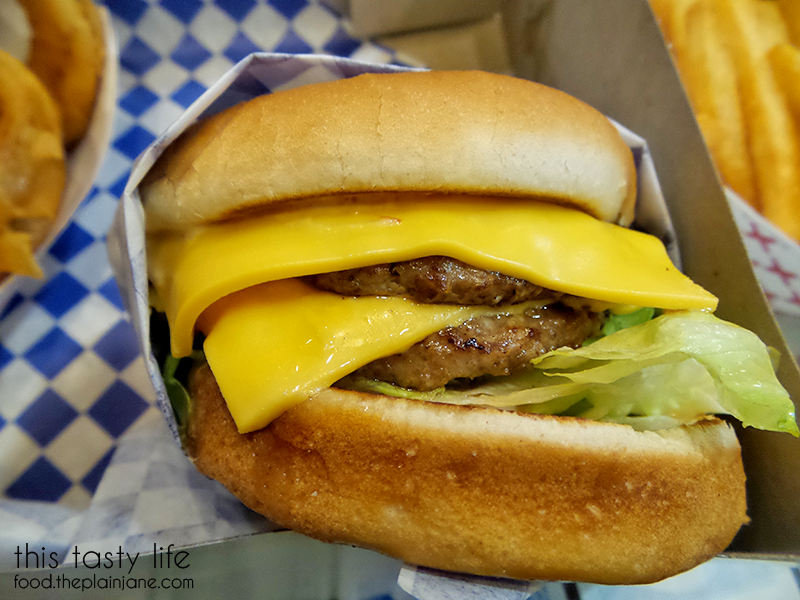 A 2×2 burger is $3.68 and I’m not sure how much extra it cost us for cheese. Jake commented the burger tasted really fresh and had a nice seasoning on the patty. 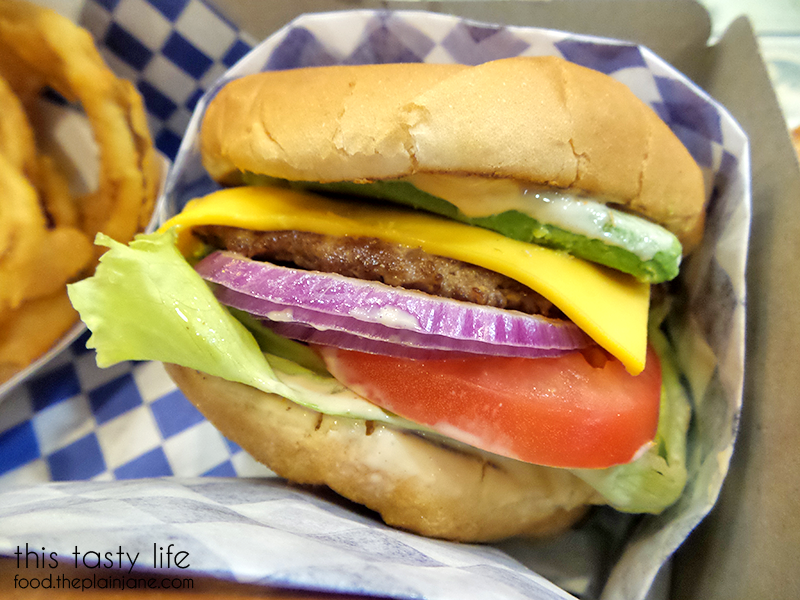 Just a regular cheeseburger is $2.48 and again… not sure how much a side of avocado costs! I could have gotten a bacon avo cheese burger for a mere $4.05 though just to compare prices. I didn’t feel like bacon that day though (weird, I know). The burger was really excellent and I was surprised by just how tasty this little thing was. Everything tasted fresh. I only wish my cheese was melted a little bit more but this was a really solid burger in any case. 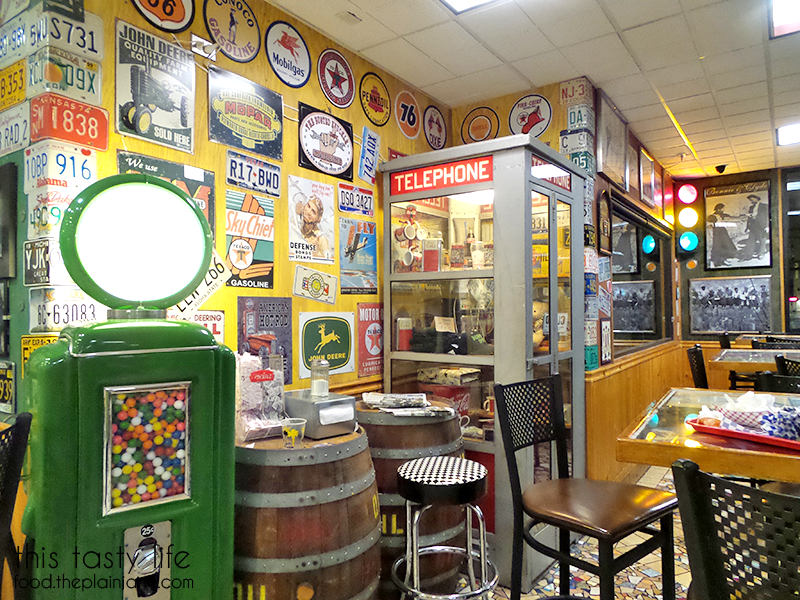 Jake and I really enjoyed the food here and wished we had been to come a little earlier to really explore their knick knacks and movie posters. We’ll definitely be back to try more even though it’s a trek to go up to San Marcos! This Tasty Life: http://food.theplainjane.com— This blog is a creative outlet for me and my need/desire to write. With a journalism degree in my back pocket, I wanted a fun way to express myself and got into food blogging one day when my friend, Alyssa and I started photographing all of the food we ate. By day, I am a front end web developer and in my off-time I like to bake, cook, and explore new foods! My boyfriend, Jake, is heavily featured in my posts. His kids sometimes make an appearance as well as my friends and co-workers. I write the way I talk, freely and openly with a bit of humor and snark. I hope you enjoy reading about my adventures in San Diego! You can email me at maryd at theplainjane.com (remove the spaces). I accept proposals, advertising inquiries, product review and restaurant review inquiries and more. Just contact me and we can discuss it! 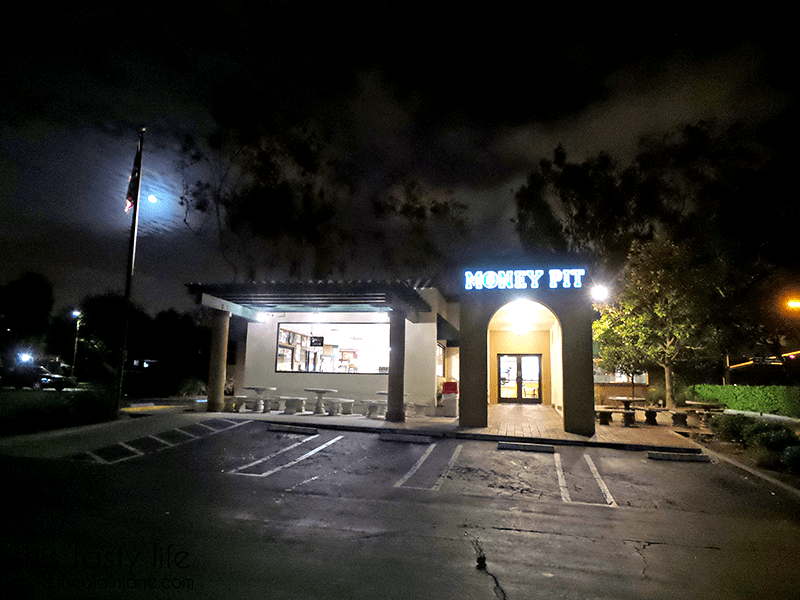 Be the first to comment on "Money Pit Drive Thru, San Marcos"